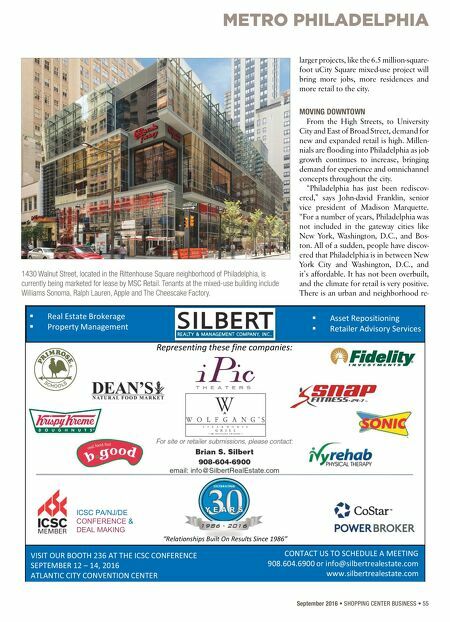 METRO PHILADELPHIA 54 • SHOPPING CENTER BUSINESS • September 2016 T he times are bright for those living and working in the Philadelphia metropolitan area. In March, the Philadelphia economy registered the greatest four-quarter job gain since 1997 with 76,200 positions filled in the last year, according to research by Marcus & Millichap. The strengthening job market — especially the increase in well-paying, white-collar positions — has sparked retail demand from Center City Philadelphia to the Pennsylvania and New Jersey suburbs. Consumers are spending more money, and retail development and redevelop- ment are following suit. The regional vacancy rate for retail in metro Philadelphia decreased to 7.6 percent during the first half of 2016, ac- cording to Colliers International. Todd Sussman, senior vice president at Colliers, notes that while there is space available, it is a tight market for smaller locations. "There is space available, but if you're an end cap or freestanding pad user for restaurants, it's very competitive," says Sussman. "The Philadelphia market has been on the forefront with healthy fast food and different concepts being brought to mar- ket, so those spaces are definitely sought after," continues Sussman. "There is more inventory for larger space due to Sports Authority, Bottom Dollar and ALDI shut- tering locations. There is even still some inventory from some downsizing from Staples and Office Depot, but smaller space is hard to come by." Thanks to the growing demand in the market, development and redevelopment efforts are increasing throughout the re- gion. In the 12 months leading into the first quarter, developers brought more than 1.6 million square feet of retail space to the greater Philadelphia market. Several large-scale, grocery-anchored projects are being delivered throughout the region, from the King of Prussia Town Center to Lehigh Valley's Hamilton Crossing. And Job Growth Drives Demand In Metro Philadelphia The strengthening economy in Pennsylvania and Southern New Jersey is heralding heavy demand, tightening vacancy and new development. 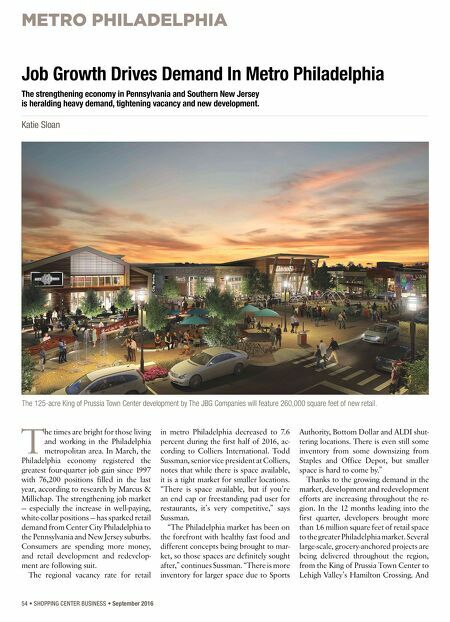 Katie Sloan The 125-acre King of Prussia Town Center development by The JBG Companies will feature 260,000 square feet of new retail.